A stay that gets its name from a strait separating the Isle of Wight from the mainland of southern England, the Solent. This traditionally windy place with strong currents can cause rough sea conditions and can make for some interesting sailing, to say the least. This body of water is also famous for hosting one of sailing’s largest events known as Cowes Week. These sometimes unrelenting sailing conditions have brought forth the conception of an entire stay, aptly called the Solent Stay. As most boats these days are equipped with headsail furlers, rigging a Solent stay is a modification that many blue water cruisers are considering, more and more. The Solent stay is an inner fore-stay that provides an alternative to the Sta-sail stay. Its benefits, similar to that of the Sta-sail Stay, are to provide an inner stay that can fly a smaller/ heavier headsail without having to unfurl, douse and change out the boats everyday headsail. 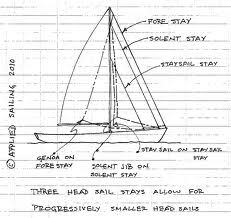 The Solent stay is unique to the Sta-sail in that the stay is rigged close enough to the fore stay at the mast, eliminating the needs for any additional back-stays, i.e. running backstays. It is also possible that the new Solent sail could share sheet leads with the boat’s existing Genoa lead cars, depending on design and lay-out, and Solent Sail cut. The tricky part, when adding any stay to the boat, be to locate a strong place on deck that is available to anchor the chainplate for the Solent Stay. Typically there will be only 1 or 2 reasonable locations for this. This may result in the two forward stays not being parallel to each other (see image left). If you can get over the appearance (easily done especially if it is removable, and I can’t say that it has ever bothered me anyways) this set-up probably makes the most sense. Especially if you consider it a good idea to move the center of effort inboard when trying to reduce sail and ensure control of the boat. ~The on-deck attachment can be moved as far inboard as a conventional Sta-sail stay! Some Solent stays are rigged to be removable and stowed aft (more on stowing removable stays here). This is a totally acceptable practice. 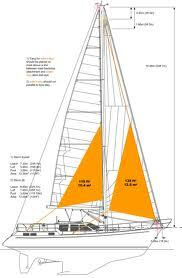 However, as the boat length increases so does the sail size and the associated hardware. Therefore, rigging the Solent stay and sail can become a bit more difficult, if nothing else more burdensome. Therefore It is also common, and totally acceptable, to install a more permanent solution by rigging stay in place with a furler. When rigging the Solent stay with a furler, a good concept might be to have a smaller sail (maybe 110%) built that will carry you through most sailing conditions, medium to heavy (i.e. say… 15-30 knots wind speed), with at least one, maybe two reef points. This sail should be cut to achieve all points of sail from the hard beat to the beam reach. Now, the headstay furler should get a full cut-over-sized Genoa (maybe 150% or larger) that can be used as a light air drifter or full cut Genoa. ~Yes, this sail will need to be furled completely during tacks, but shouldn’t be a problem in light airs. This new light air headsail should be cut for working upwind from a close reach, to downwind, just below the beam reach for light to moderate conditions (i.e. say… 5-12 knots wind speed). For more foresail options regarding downwind sailing, read our blogs here and here. Lastly, there is one final consideration: the tension of putting two fore-stays opposite of the one back-stay can end up sharing the loads. This can lead to the Solent stay sagging to leeward, moving the draft aft and causing issues with being able to point the boat upwind. This is not preferred in most heavy weather conditions, especially when having to work upwind. The solution lies in the how the rig tune is set up. The headstay will need to be slackened a good bit, and the new inner Solent stay will need to be tightened fairly tight; so that the backstay is pulling on the Solent Stay not the headstay. This set up will compliment the aforementioned light air Genoa/ Drifter sail on the headstay and everyday jib on the Solent Stay. In the case of the Solent Stay being removable, make sure your Highfield lever is set to a tighter tension than the Head-stay. This should cause the Head-stay to become slack when the Solent stay is in use. Then to combat the leeward sag of the Solent Stay even further, it is also a good idea to make sure the back-stay is at its maximum recommended working tension (usually approx. 30% of breaking strength). As always, you should seek the advice of your local rigger to ensure this Solent stay system is set up completely and properly. Have question or a comment, please leave us a few words in our comments box below. Thanks for contacting us. I do think you should be able to add a sprit no problem. From the sound of it the V shaped bracket that you refer to is very likely to support a block (or two) for a spinnaker halyard (s). If you compliment this with a Top Down furler, I think this would be the most user friendly set up. For the Solent Stay, you will need to choose a spot (may already have one) pretty close to where the backstay connects, about a 12-18 inches from the top of mast. Then a sheave box for the halyard will need to be installed. The biggest part here is the deck attachment (and storage of the stay when not in use), some boat’s already have a strong point for this inside of the headstay, but some have to add it. Send us some pictures to sales@theriggingco.com and we can help further. We own a Bene 473 and installed a Solent rig. This boat is actually designed to have one as an option and you can obtain a CAD drawing of the deck fitting that attaches to the bulkhead separating the chain locker and the V-berth. The mast also is prefitted to accept the inner-stay which makes for an easy installation. This sail comes in handy above about 23-25 kts or more of wind when beating and is great for dead-down-wind with the genoa. Thank you, great comment and useful info for Beneteau owners! Gents, Generally a nice piece but I respectfully suggest there are a few details (those pesky critters) I would argue against. I have consulted on perhaps eight of these stays and only one used a hyfield lever, because it was already there. The top of mast to anchor-bulk-head version establishes a triangle that does not lend itself to making sails that will work easily across the speed and angle spectrum conductive to the sail’s size. The Aspect ratio is way to high. This condition is exacerbated in the event of the boat using a furler. The use of a high field lever is not suggested, at least by me. Rather a tackle system. They are heavy and clunky. For the tensioning part of the installation costs, they may well me more expensive than the equivalent portion of the entire system using cordage and thimbles. They require the lever and the sail to be carried forward and connected to the boat. If the lever is to remain connected to its location ion the bow, it needs to be secured to stop banging around. Then one must attach the stay, under conditions when the amount of time you spend on the bow is preferred to be less not more. There are ways to mitigate all this but they require their own systems and more steps in the procedure. Once set and the stay is attached, it is not possible to adjust the tension on the stay, well not without a lot of work. All ‘stays’ regardless of material will stretch over the hours the stay is set. With the tackle arrangement, the tension on the stay can be adjusted to compensate for this. Independently one should, I strongly suggest a spectra type cordage, NER EnduraBraid for instance, one can use ‘regular’ (bronze) hanks and need not break the bank for soft hanks. IF one installs two pad eyes, one either side of the mast in the appropriate location, AND a spectra loop or lashing passing between the two, to which the top of the stay is secured, AND installs a halyard deflector in the bight of the subsequently formed V, one can use the boat’s second genoa halyard if so equipped and so avoid cutting holes in the mast, for a stay fitting and halyard. This method also lends itself to being installed with the mast in place. A Quest 30 used in the Bermuda 1-2. Outbound 44 used in the OSTAR on 2009. A J-105 on which I sailed DH in things like the Halifax race. Beneteau 45’ish’ footer Used for cruising in the NE. The concept is really good, but the devil IS in the details. Thanks for commenting on our website. I believe I've linked to your site a few times on our blog (at least once). So it is nice to hear from you. I like all of the points that you make here and they all seem valid. So you will hear little arguments from me. The point of the blog is to merely inform people of the Solent Stay as an option. As they say there are many ways to skin a cat. You are taking the more synthetic "new school" approach, and I am coming from more of the "old school" perspective, both have their place and if executed properly are very functional. So thanks for the second view point. I also learned from your high aspect sail cut tid bit, very informative. It sounds viable and makes sense. Although, I think about boats with non overlapping jibs with 7/8 fractional masts (don’t need to name them, there are plenty). They must suffer from this as well then? We are not sail makers (and do not claim to be in the least). Are there any sail makers out there that would like to comment on this? Anyone? Bueller? PS – I bet I can connect my highfield lever faster than you can reeve and lash your tackle ;-0) Game on!!!! Haha…just a joke and thank you for taking the time. I am in the process of adding a solent stay to my Beneteau 473 for offshore use. My plan is to add a furler to the inner-stay with a heavy weather jib 100-110%. I know these inner stays are often used for spitfire (storm) jibs, but with the furler changing out sails would not be ideal. Can you suggest a solution? Thanks for commenting. I think adding a furler and making this a permanent stay (if I hear you correctly) of the boat is a great idea! One concept is to loosen the existing headstay/ furler arrangemnet a bit and cutting a full size large Genoa for it. 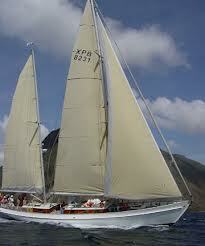 This is good for light air sailing, but it must be furled to tack, due to the small space between furlers. This sail should carry you in a range of 5-10 knots of windspeed. 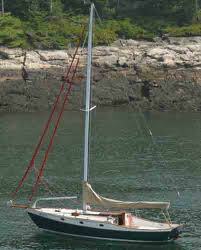 Then adding the permanent Solent Stay/ Furler arrangement with a 110 (or so) Jib that might have one reef to it. This would be the day in and day out foresail for the boat. Ideally it should be a sail that can be flown in 15-20 unfurled and 22-30 reefed, but that conversation is best suited for a sailmaker. Add a whisker pole and your boat should be able to handle various points of sail and wind speeds without much ado. Hope that helps thanks for taking the time. I have a CS36 (Canadian Sailcraft) with two docking cleats close together in the exact spot on the foredeck where one would attach an inner forestay or Solent stay. Is there a way to use those cleats as an attachment point (I’m thinking two cleats could possibly distribute load somewhat) and how can I tell if they’ll bear the load? Ordinarily I would just reinforce the spot and move the cleats elsewhere but it would involve major below-deck rearrangment. The trip I’m planning would probably have me using that particular stay for a hank on storm jib. Hello! Thanks for taking the time to comment. Sorry I am bit late on getting back to you. To answer your question, NO, I would not use the horn cleats to attach an inner forestay of any kind. Horn cleats (although very strong) are made to be loaded in shear and therefore are typically not tied into the boat’s keel. The chainplate for any stay must be tied into the boat’s keel by way of the hull, bow stem, transom or any other structural knee or bulkhead. Most likely there is an anchor locker bulkhead nearby and this is usually the best place to tie into for an inner forestay. Although you will need to make sure that it is an actual structural bulkhead. Be sure to contact your local marine carpenter, fiberglass repair man, or rigger if you are unsure. I am sure this is not the answer you were looking for but I hope that it is helpful either way. The Catalina 445 comes with a Selden bowsprit which is intended to be used with a downwind sail and a luff rope furler on a continuous line. That sail needs to be taken down after it’s furled. 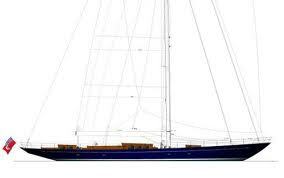 With some reinforcement do you think it would be practical to put up a conventional furler and a rig this as a solent rig? Solo sailing a lot, it would be nice to have two sails up front, similar to what Tartan yachts does. Thanks for the comment and YES this is totally do-able, BUT not from the sprit. Your boat is a perfect candidate and we do this upgrade quite frequently. You would install a tang on the mast and depending on how the bow is configured, add a chainplate near where the forestay connects now. Then install a stay and rig it with a furler. This would become the tightest stay and fly the boat’s everyday foresail….maybe even make it self tending depending on what type of conditions the boat sails in. 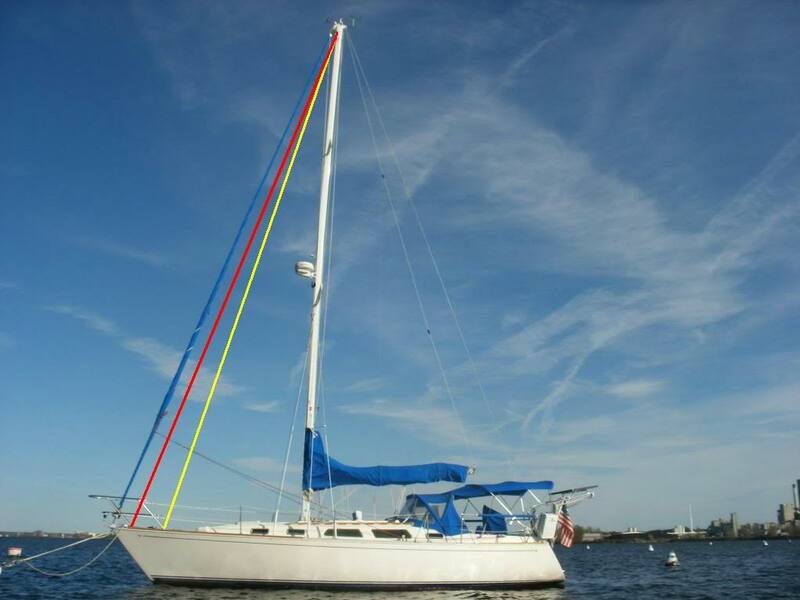 The old headstay/furler is then loosened a bit and outfitted with a large light air drifter sail, which can also be very handy when poled out sailing downwind. ‘Appreciate you checking us out and thanks for the read. Please don’t hesitate if we can help further. Thanks Jim, this looks like a good option too. Will carry on the research, and thanks so much for answering my questions! This looks like a good concept! Great blog to check out for Rigging ideas. Is it beneficial to add running backstays with a solent stay? It can be beneficial, but only to eliminate excessive mast pump if that is an issue. A true Solent Stay does not require the use of additional back-stays as it should be rigged close enough to the headstay so that it can utilize the boats dedicated backstay. All-in-all It is not necessary and defeats the purpose, to use running back-stays for a Solent Stay. If mast pumping is an issue there may be better solutions and you should consult a rigger for your boat specifically.